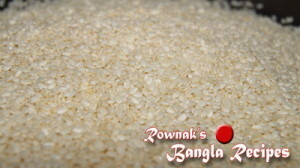 Every time I think that I have collect enough Bangladeshi recipes, My lovely wise readers remind me thousands to go. 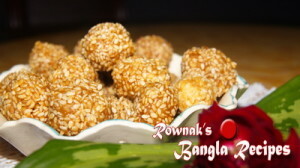 Sada Tiler Naru / Sesame Seed Ball is very traditional simple and tricky recipe. The tricky part is in this recipe sugar consistency. Please be traditional and add it in your kids lunch box, trust me they just love it. Enjoy. 1. 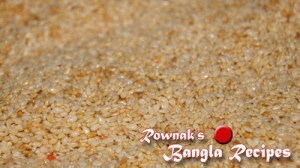 Dry roast the sesame seeds for few minutes and pour it in a wide bowl. 2. 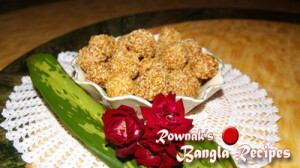 Take a pan and add jaggery and 1/3 cup water; it till it becomes like gum. 3. Now turn off the heat and add roasted sesame seeds and mix it well. 4. Let it cool down a bit and Spoon out enough to make small balls. Rub a little oil onto the palms of your hands before rolling into balls. 5. Sada Tiler Naru / Sesame Seed Ball can be stored for up to 3 months in a airtight container. 1. When you roast sesame, be careful not to over roast and stir constantly. 2. Roll it till it hot. 3. If it cool down and crumble a part, heat it up bit and roll again.